Our company was founded in 1968 and has been growing in size ever since. From a small workshop has developed a modern and competitive business whose main concern is your complete satisfaction. Giroud SA constantly talk to their customers and work closely with them every day.This way, we can develop and improve our range of products and services to meet the needs of an ever-widening market. In order to do this, a complete range of high-precision tables and some other products are available. Our know-how and quality policy insure you to receive a perfect product. Come and visit us, because for our 50th anniversary, we will put in play a precision cross carriage compatible Schaublin 102. A draw will take place and designate the lucky winner ! Always more accurate due to the direct position measurement. The linear measuring system consisting of a digital ruler and a read head, acquires the position of the linear axis without additional mechanical transmission elements, which makes it possible to exclude several possible sources of errors (positioning errors due to the wear of the screw, the play and the error of the pitch of the screw, etc ...). 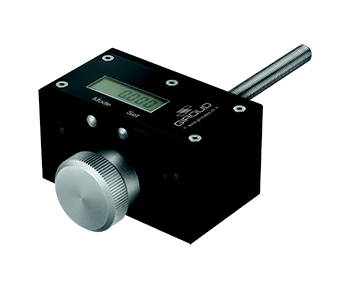 For improved ergonomics, the measuring system and its power supply are fully integrated into the slide. No cables or external elements interfere with the maintenance or movement of the slide.